GLOBAL ENVIRONMENTAL PRODUCTS is one of the world’s leading producers of specialized Street Cleaning Equipment. Headquartered in San Bernardino, CA, their Purpose Built, Heavy Duty, and simply Tough Street Sweepers are all Made in the USA. Global Sweepers are designed to sweep every day, offering the Lowest Total Cost of Operation. Global Sweepers utilize a single engine to do the job, reducing fuel consumption and maintenance costs. 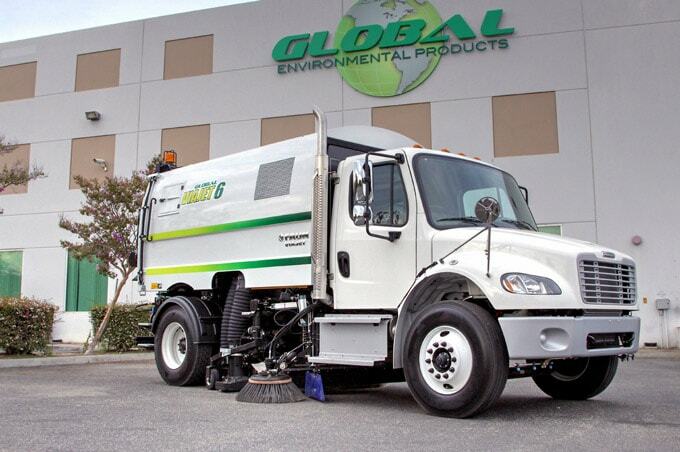 An array of options allow Global to build a street sweeper specific to customer needs. The Global Equipment single engine design includes low fuel consumption and low operating noise levels. Global M4 and M4HSD models operate at 76 dBA while sweeping! Yes, sweeping at night without waking residents! The M3 Three Wheel sweeper has travel speeds of 24 mph. The M4 is the only purpose-built chassis sweepers that can reach speeds of 65 mph with the ability to dump to rear or side. Electric Hybrid Street Sweeper – the only one of its kind. Global’s three-wheel street sweeper is designed with full suspension, not available on competitive products. It boasts the largest capacity hoppers with stainless steel, a heavy-duty sweeping system, one of a kind purpose-built cab and chassis. Large 47” gutter brooms allow these sweepers to pick up as much as 3-tons of sand per minute! Their M4HSD is designed to take on the worst of the worst sweeping conditions such as construction site cleanup, state highway sweeping, and road resurfacing including millings, heavy sand and chip seal. This unit will sweep sand, gravel up to 3-Tons per minute with sweeping speed of 5 – 11 mph.